Get ready this festive season with PAC's revolutionary lightweight and non-drying liquid lipsticks in stunning fall-winter appropriate shades of nudes, warm orange, berries, pumpkin spice latte.These give you an opaque payoff with just one swipe! 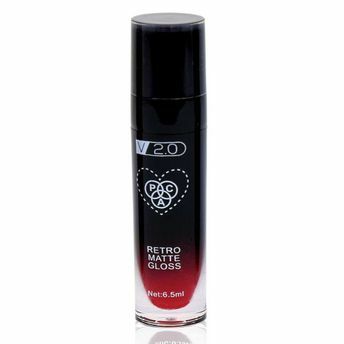 The Retro matte lip glosses dry down matte beautifully right after one swipe and lasts through thick and thin! Available in unique shades that will surely steal everyone's heart. These are too good to be true! Additional Information: PAC Cosmetics is a professional makeup artist brand bringing in the highest quality, innovative cosmetic products to all makeup lovers and professional artists.Started in 2002, PAC is a team of conscientious and committed experts dedicated to making tools that help you perfect your makeup, minus all the fuss, just as you desire.The products used have been bought from worldwide and are completely free from any heavy metal or animal testing to ensure that only the best is delivered to you. Explore other options for Lip Gloss here. Explore the entire range of Lip Gloss available on Nykaa. Shop more PAC products here.You can browse through the complete world of PAC Lip Gloss .Alternatively, you can also find many more products from the PAC Retro Matte Gloss range.